From the drawing board to the launchpad, space missions depend on a supply chain in order to launch on time and under budget. Blockchain technology can help. Rudy Brathwaite is co-founder and chief information officer of SupplyBloc Inc., a company that brings blockchain technology to supply chain management. For more than 20 years, he has helped clients move products from point A to B. Recently, Brathwaite has been interested in the potential for blockchain tech to help optimize spacecraft development. Before pilots and technicians launch a rocket into space, they must secure the links in a supply chain of many companies and contractors. A supply chain is essentially the network of people and organizations that move products from point A to B, or from creation to consumption. For example, a supply chain for spacecraft begins with the sourcing of raw materials such as titanium or aluminum. Those metals are then sent from the source via distributors to the manufacturers, where they are turned into steering fins, frames or other parts of rocket. Those parts are then sent to a facility, where the spacecraft will be assembled and eventually launched. Everyone involved in that process is considered a link within the rocket's supply chain. The problem is that rocket supply chains, like many others, are complicated, costly and time-consuming. For companies to build and launch rockets most efficiently, the distance between their supply-chain links needs to be short, their business interactions have to be transparent and the tracking of the moving parts must be optimized and available in real time. Blockchain — an encrypted ledger that publicly tracks transactions — offers suppliers and manufacturers the ability to record and manage transactions in digital databases that are secure and decentralized, which means they don't rely on third parties like banks. Leaving unnecessary mediators out of the supply chain not only saves money but also helps to speed up production. Blockchain also allows businesses to create self-executing contracts known as "smart contracts" and to use cryptocurrency such as bitcoin. These elements help with supply chains by making interactions between links more transparent, faster and cost-efficient, and by vastly improving the ability to track products from point A to B. 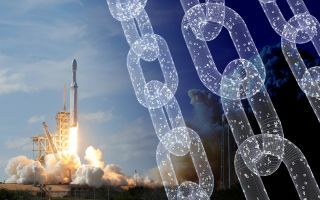 Thanks to NASA's embrace of blockchain-related products and services, we will begin to see the shortening and strengthening of spacecraft supply chains in the very near future. NASA researchers have started using blockchain technology to improve the "cognitive networking and computing infrastructure" of deep-space missions in an effort to make better data-driven decisions for autonomous spacecraft. Broadening this blockchain implementation to include a superior means of supply chain management will benefit the economy — making it easier and less expensive to bring products to market — and allow NASA to economize costs without compromising quality. This solution is just as important to leaders like SpaceX's Elon Musk and Blue Origin's Jeff Bezos, because both seek to run the fastest — and go the farthest — in their own private space race. Both are also businessmen with an eye toward improving their companies' bottom line. And both entrepreneurs are ambitious innovators who have revolutionized not just the rockets we launch into space but also the cars we drive (Musk's Tesla) and the way we shop on Earth (Bezos' Amazon). If companies like SpaceX, Blue Origin and Amazon are to remain at the forefront of innovation, or if NASA hopes to develop new and improved ways to study and explore the universe, these companies and agencies must understand why blockchain is indispensable to remaking the supply chain. All of these organizations have shown interest in blockchain's potential. They just need to follow in the footsteps of IBM and integrate blockchain into their existing rocket supply chains in a more rapid and effective manner. The accountability, tracking capabilities, transparency and efficiency that this technology can create can't be shrugged off. The ability to precisely track and manage the creation and movement of rocket parts is hypercritical. For example, the absence of even the smallest part can delay a rocket launch. Without an organized system for locating every nut, bolt, nozzle or electrical cable needed to build a spacecraft, space missions are more likely to face costly delays. When workers are forced to waste time searching for items that could have been misplaced at the work site or lost in transit, these delays can cost NASA millions of dollars and even threaten funding for future missions. A blockchain-integrated supply chain network offers the oversight necessary to ensure there is trust among the various wholesalers, distributors, manufacturers and anyone else involved. Every transaction between these entities and the products or parts they are exchanging then becomes an entry in an immutable digital ledger, reducing the potential for fraud, mismanagement and abuse. With blockchain technology, gone are the guesswork and the red tape that are the chief reasons bureaucracies are so, well, bureaucratic. Gone, too, are the overlapping redundancies behind most lost shipments and revenue losses. To banish these threats is to begin anew, with a supply chain network as sound as its physical corollary. From supplying astronauts with the equipment they need for training on Earth to watching spaceships carry cargo to the International Space Station or embark on deep-space exploration missions, blockchain will soon bind us together. It is the start of the next chapter of the Space Age.